Specially shaped sound sleeper neck and shoulder pillow ensures that you sleep better and wake up more refreshed. Cutaways on the side and the proper fill density take the strain off your neck and shoulders. Made especially for side sleepers, but works for all positions. Washable cotton cover. 19"L x 17"W x 7"H. Imported. I've been sleeping on this pillow for a couple of weeks now, and I think it's better for my neck than the last pillow I had. I like that it fits inside a standard pillow case, too. I haven't seen any pillow quite like this in the store. I LOVE IT!!! This is the best pillow I have ever laid my head on. Its firm with the right amount of elevation for me. I love the shape because it rests atop your shoulder when laying on your side. I think its great for back sleepers as well. I'm going to purchase another one to put between my knees while I sleep. Its very durable and I think it will last a long time with good care. I have bought more pillows than I can count. I came across this pillow and thought what the heck, I'll give it a try and I am so glad that I did. This is a VERY comfortable pillow.I wake up each morning without neck or back pain. Its great. I would recommend this pillow to everyone. Try it for yourself. You won't buy any other pillow. THIS PILLOW DID NOT SUPPORT MY NECK AS MUCH AS I NEEDED IT TO. IT WAS TOO SOFT. I often wake up with neck and shoulder pain. Have been awaking with neck pains for a while. Need help. I looks compfy. I have neck problems and find it difficult to get it in the proper alignment to sleep I have tried various pillows and hoping that this one will be the solution I need. NECK PAIN AND ARMS FALLING ASLEEP. I have neck and shoulder pain when I wake up. Recommended by a friend who is also a side sleeper and has one. Would like to see if this pillow will improve my sleep position. Have been experiencing some shoulder pain. It looks like what I need for a comfortable sleep. Looking for comfort and support. This is the third neck and shoulder pillow I've bought from Easy Comforts. I have chronic neck and shoulder pain and this is the only pillow I can use that does not make my pain worse. These are the best pillows we’ve tried! This is our 2nd order and we highly recommend. They also last longer than most pillows. I bought one for myself and my grandson loves it. So now we'll each have one. Perfect for side sleepers. i am a side sleeper and it looks like this will work fine. This product really helps my neck pain. Hopefully for a better night sleep! I have been getting a soar neck so i thought i would give this a try. Best pillow ever designed for side sleepers - although it does not hold its shape and must be repurchased every year. My son has neck problems, this should help. The search for a side-sleeper pillow continues! My daughter has one and absolutely loves it so I thought I would give it a try. Without a doubt this is the BEST pillow we've ever tried!!! We have a closet full of "special" pillows that we've purchased and paid a lot more for than the Sound Sleeper. This pillow works for side sleepers -- it's the best and we highly recommend it! See if I can sleep better at night. BEST ANSWER: Thank you for your question. The fill is made of 100% polyester fiber. We hope this information will be of help to you. neck and shoulder sleep comfort with neck pillow? BEST ANSWER: Helps when I lay on my right side. otherwise, it is not helpful. I can only stay on my right side for an hour or so due to back pain. Its just one pillow...supports your head and neck. Can I use an ordinary pillow slip? BEST ANSWER: Yes. A standard pillow case works. Yes you can. I put one on mine. It fits snug but I like it. This pillow is wonderful. I love that I don't have to stack several pillows on top of each other now. I sleep very comfortable. Hope I helped??. YES, however I FND IT MORE COMFORTABLE WITHOUT. WHEN YOU COVER YOUR SHOULDER AND NECK ARE RESTRICTED. Yes, that was a concern of mine also, but it fits nicely into a standard pillowcase. Yes. You can use a standard pillow case. Is there any latex in the product? BEST ANSWER: There's no latex in this pillow. Thank you for your question. 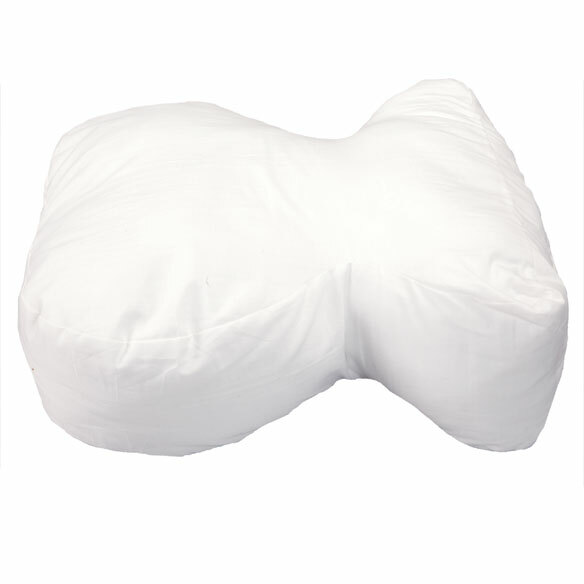 The outer cover of the pillow is 80% Polyester/20% Cotton the fill is 100% Polyester Fiber and the cover is 100% Cotton. We hope this information will be of help to you. Is thee any prep work before using this pillow? BEST ANSWER: Thank you for your question. No, there is no prep work. We hope this information will be of help to you. Can I find this pillow in a store? BEST ANSWER: Thank you for your question. Our items are sold through our website or catalog only. We hope this information will be of help to you. if you can't sleep on this pillow can you return it. What is the return policy? BEST ANSWER: Thank you for your question. We have a 45 days return policy. If you are going to return the item we ask that you contact us first. We hope this information will be of help to you. I'd like to buy an extra pillow cover for the pillow .Do you sell therse separately? BEST ANSWER: Thank you for your question. At this time we do not sell an extra pillow cover for the Sound Sleeper Neck and Shoulder Pillow. We hope this information will be of help to you and apologize for any inconvenience.